The last few days have seen me listening to a lot of thrash metal, death metal and generally rather extreme style music. Check out my Last.fm account and you’ll see what I mean: Slayer, Morbid Angel, Stone Sour, that sort of thing. But most of my listening has been in the car and next door while writing — tracks that don’t get registered on Last.fm. 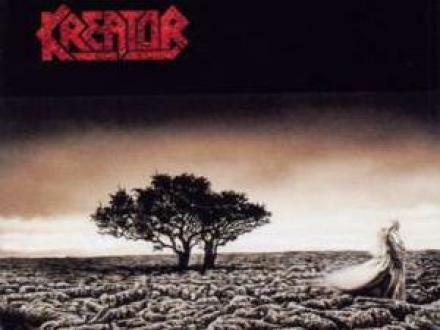 This morning I drove into St Andrews listening to Kreator, a German thrash band who are still recording and touring. Their debut album had the morally-dubious title of Pleasure To Kill, but as I read through the CD sleeve notes I was impressed by the names of the four musicians. Back in the mid-80s when thrash metal, and later death metal, were growing out of the NWOBHM/punk fusion a number of bands arrived on the scene with some wonderful names, and their members with even more obscure monikers. Canadians Voivod, for example. Their name was taken from a military-type gentleman referenced in Bram Stoker’s Dracula, had four members: Blacky, Snake, Piggy and Away. They — probably rightly — assumed that non-French speakers would have trouble pronouncing Jean-Yves ThÃ©riault, Denis Belanger, Denis D’Amour and Michel Langevin. And how about Floridian death metal band Morbid Angel whose founding guitarist goes by the name of Trey Azagthoth? Surely that’s not his real name! No, his real name is George Emmanuel III. That doesn’t quite sound like the name of a dark metal lord of death, now does it? No wonder he changed his name. Mille: So, fellow members of seminal German thrash metal band Kreator – with a ‘K’ – have you chosen your stage names yet? Band: We have, O mighty purveyor of all things extreme. And metal. Mille: Good, then I shall begin — for this is my band, and by 2006 I’ll probably be the only one of us still in it. I have chosen “Mille” as my name. It means in Latin (something like) a thousand. For my guitar makes the sound of a thousand rods of metal striking the earth, and we shall command thousands of metalheads under our flag of hate. JÃ¼rgen: I shall be called Ventor. For with my powerful drum kit I shall be a vent for the frustrations of a generation. They shall fall before my percussive pounding and worship at the feet of extreme music. Michael: I have taken the name Wulf — spelt the German way, naturally — for like the wolf I am a creature of the night, and with the howl of my guitar I shall sound the dark call of REAL METAL. Rob: And I shall be known as … Rob. Mille: [In slight disbelief] What?! Rob: Rob! I shall be known as Rob. Rob: Yes. Rob. It’s short for Robin. Or Robert. Or in my case Roberto. Wulf: But that’s rubbish! That’s just your name, shortened. Rob: Shut up! I was up all night thinking of that. With an English dictionary and everything. That’s how I imagine it happened. I could be completely wrong, however. Still, regardless of how they named themselves they have managed to release quite a tasty catalogue of particularly rhythmic, distortion-laden tunes. Good effort chaps — keep up the good work. And tomorrow I want to talk to you all about ducks. How can I sleep now, wondering what you will say about them tomorrow…? I know a genuine Wulf and despite having long flowing hair and a fulsome beard (or possibly because of) he’s one of the nicest, gentlest, most amiable chaps you could ever wish to come across. I also have a niece called Millie, which is close enough for Jazz, but not presumably for metal. My brother is called Rob. Notwithstanding the fact that I have just holidayed in the Isle of Wight, it may reassure you to know that I know no-one called Ventor. Ha! Too extreme for me, this Death Metal. Good ‘ol Rock does it for me!! (Magnum etc). Actually, as I write this I’m listening to the Scorpions…. Now they are German too and rather good, I feel….